Phytochemicals are naturally occurring bioactive compounds found in edible fruits, plants, vegetables, and herbs. Unlike vitamins and minerals, phytochemicals are not needed for the maintenance of cell viability, but they play a vital role in protecting neural cells from inflammation and oxidative stress associated with normal aging and acute and chronic age-related brain diseases. Neuroprotective Effects of Phytochemicals in Neurological Disorders explores the advances in our understanding of the potential neuroprotective benefits that these naturally occurring chemicals contain. Neuroprotective Effects of Phytochemicals in Neurological Disorders explores the role that a number of plant-based chemical compounds play in a wide variety of neurological disorders. 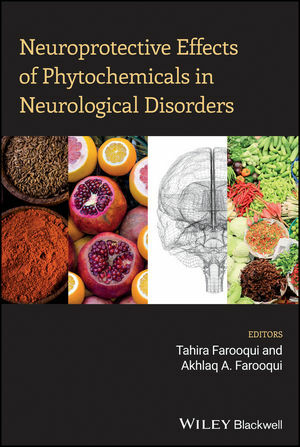 Chapters explore the impact of phytochemicals on neurotraumatic disorders, such as stroke and spinal cord injury, alongside neurodegenerative diseases such as Alzheimer's and Parkinson's Disease, as well as neuropsychiatric disorders such as depression and schizophrenia. The chapters and sections of this book provide the reader with a big picture view of this field of research. Neuroprotective Effects of Phytochemicals in Neurological Disorders aims to present readers with a comprehensive and cutting edge look at the effects of phytochemicals on the brain and neurological disorders in a manner useful to researchers, neuroscientists, clinical nutritionists, and physicians.